Add to Basket | View Basket. A cornucopia of choral music as entrancing as its composers are obscure. 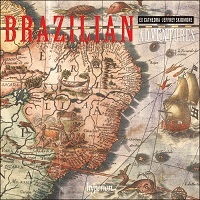 “Jeffrey Skidmore is not the first musician to be charmed by the cultural riches and musical heritage of Brazil, and he won’t be the last, yet his visit has culminated in an unexpectedly touching and beautiful portrait of Brazilian early music that is sure to surprise even the most intrepid musical explorers. ‘Brazilian Adventures’ is striking not only for its tender approach but also for the focus on later historical styles than one normally associates with these performers. The two Masses are contemporary with late Haydn and yet incorporate many late-Baroque features while also hearkening towards a softer, more intimate early Romantic sound. The movements of both Masses are framed and separated by a selection of motets hinting at the huge variety of Brazilian music that still awaits modern performance. “Missa pastoril para a noite de natal by José Maurício Nunes Garcia (1767-1830), a priest from Rio, is scored for three castratos, two falsettists, tenor and three basses. The great surprise of this Mass is that it was also orchestrated for a rich ensemble of violas, cellos, clarinets, bassoons, trumpets, horns, timpani and organ. An exquisitely simple pastoral theme infuses the work with a delicate wistful air to which the performers of Ex Cathedra respond beautifully. There is some wonderful clarinet-playing throughout and a sensational ‘Laudamus te’ solo from soprano Katie Trethewey. Skidmore’s notes invoke sunshine-filled Christmases and this is an image that certainly shines through his interpretation. Listen to a selection of tracks from our CDs. Opens in a new window for uninterrupted streaming.